A little while back Chris Lin wrote his first guest post on adidap : Step into wedding photography with these 20 poses that focused on posing a couple during the wedding day. Due to the huge success of this post, we have contacted Chris again and he agreed on writing another tutorial on wedding photography. If, like me, you find posing the groom a challenge then I bet you are about to enjoy this article. The list may not be comprehensive; but it should give you a good base from which you can incorporate your own style and vision. A big thanks to Chris who is also the editor of SLR Lounge, creator of Photoshop Actions and Lightroom Tutorials. 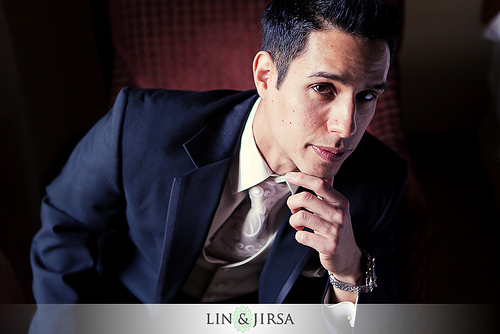 All images are copyright Lin and Jirsa, Wedding Photographers in Los Angeles. 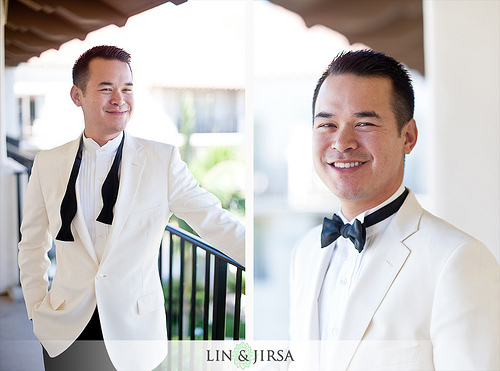 The classic, must-have portrait of the groom has his body angled, hand(s) in pocket and a casual, natural smile. Make small adjustments in the angle of his body and face to find the most flattering look. 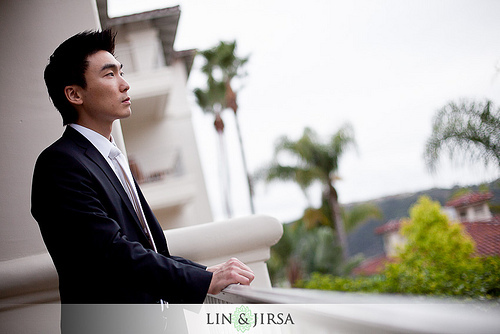 If the hotel room has a balcony, this is a great scene for posing the groom in a contemplative pose. With his hands on the railing and his body facing out, have your groom look off into the distance and contemplate his last few hours of freedom. Windows make great frames for your compositions. 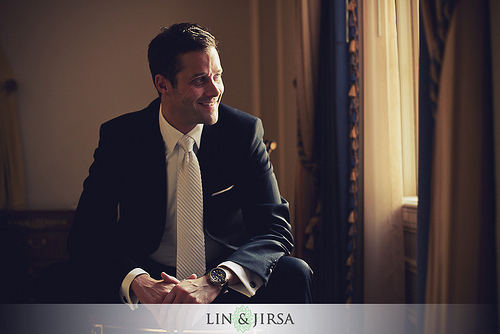 A classic pose is for the groom to gaze out the window in anticipation for the big moment. The feel and story of this pose is very similar to the balcony pose above. Along the same lines as the pose above, make sure you utilize the nice, soft, dramatic window lighting and do a few more poses. Have the groom sit in a chair with his hands on his knees. He can look at the camera for a few shots and out the window for a few (see pose below). 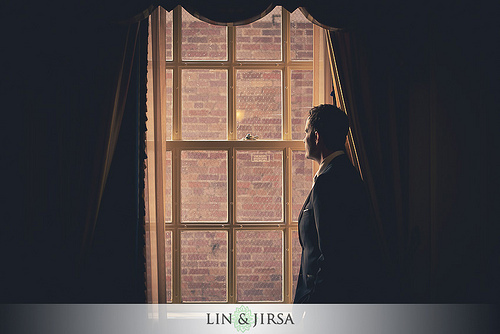 As mentioned above, use this great lighting scene for a variety of looks and angles on the groom, including this one of him looking out the window. 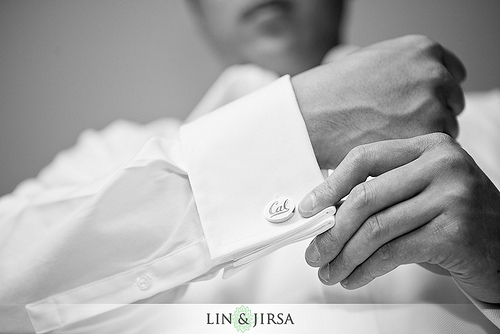 As the groom is getting ready, make sure you also focus in on the details. One of these poses is the adjustement of his tie. 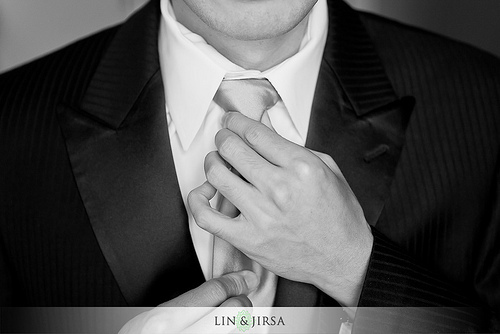 Similar to the pose of the groom adjusting his tie, you can also snap unique angles of other aspects of his attire. Another one of these would be his cufflinks (pictured below) or his shoes (not pictured). 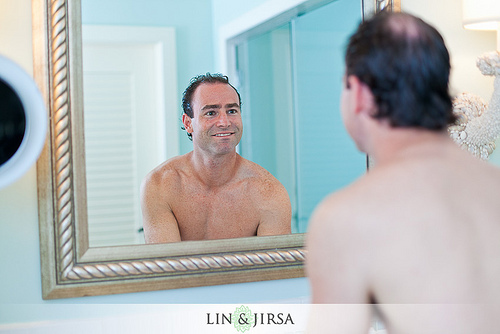 Whether you’re catching the groom before he’s starting the getting ready process (as pictured below) or catching the final check before he heads out the door, using the reflection off of the mirror is a great angle for the moment. You can either catch it naturally or ask the groom to re-enact it (with a smile of course). 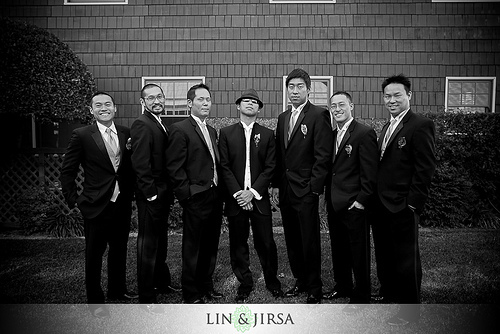 Moving on the groomsmen (group) shots, a must-have is the classic line up. Angle them all inwards, focus on expressions, and snap away. Definitely not a must-have, but a good way to get some fun shots is to have them jump. To add interest and move away from the cliche, use unique lighting. 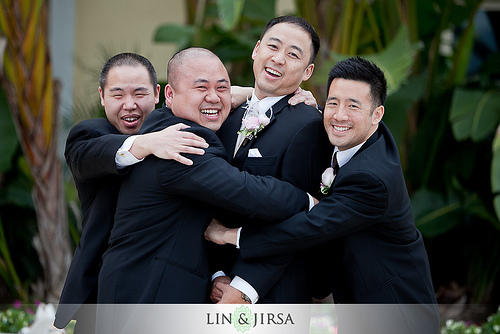 The idea behind certain groomsmen shots is often to get them out of their comfort zone so that fun expressions come out. Pick him up and swing him around and see what happens. Another classic pose is the bowling pin formation. Make sure you have all the guys lined up in near-perfect symmetry with identical poses. 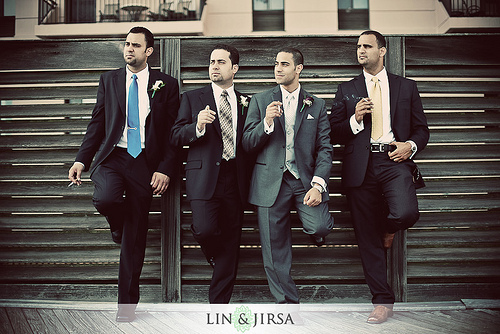 For a casual shot, put the groomsmen up against a wall, have them kick a leg up and either look off or into the camera. 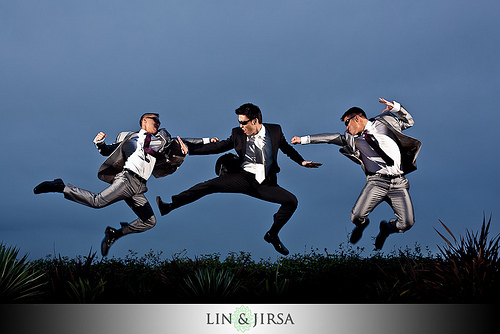 In boy-band-esque fashion, stagger your groomsmen haphazardly. The only rules here are to make sure that the groom is the center (and thus the focus) and to make sure nobody is covered by another groomsman. A random pose we came up with is the secret service pose. 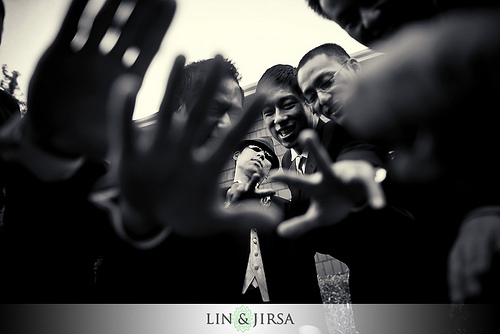 This is where the groomsmen act like they’re blocking the camera, with a small space for the groom’s face. Of course, picking up the groom can always lead to some fun. There’s nothing like a super tight, uncomfortable hug to bring out big smiles, laughs and candid expressions. 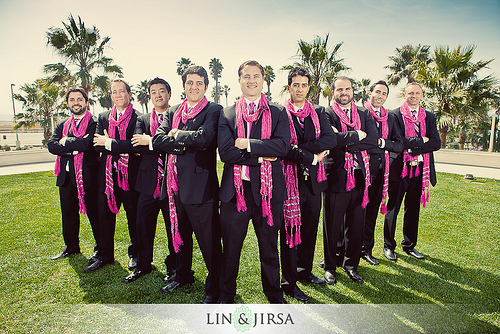 We hope this list of groom and groomsmen poses helps with your wedding photography. Of course, we always welcome your comments below. love the secret service + uncomfortable hug! thanks for sharing! Hey, nice shot.. I pictures looking so beautiful.. well done. The wedding must be a stunning and charming occasion to experience. By seeing the pictures I recalled my cousins wedding. Last year we took flights to Bali for his wedding as he lives there. The wedding altogether was an amazing event to attend. Nice post and the pictures made me recall what I had experienced earlier. Again thank you so much for sharing your ideas. They really reassured and inspired a newbie…me. God Bless. Awesome pics and poses. thanks for sharing your great idea. it will help quite to have good stuff. i hope to see more such stuff. nice pictures after seen your wedding images.i recalled my cousins wedding which held last year we really enjoyed.nice post this made me recall what I had experienced earlier.